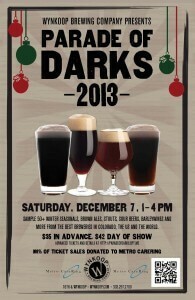 A holiday tradition, the highly anticipated Parade of Darks is a showcase of beers in the amber to opaque categories. Featuring over 80 beers from 35+ breweries, this event raised over $14,000 for Metro CareRing last year. Participating is sure leave you feeling warm and fuzzy, as your ticket gets your a commemorative glass for unlimited sampling, and 100% of the ticket price will be donated. Metro CareRing is Denver’s largest hunger-relief organization directly serving families. In addition to providing nutritious food to hungry people, Metro CareRing also works to tackle the root causes of hunger and malnutrition. Using a multifaceted approach, Metro CareRing is an innovative leader in addressing problems related to hunger, with programming offered in hunger relief, healthy living and nutrition education, self-sufficiency, and supportive services. AC Golden: 2012 Whiskey Barrel Aged Imperial Stout, Dark Fruit Sour Frambois Noir. Bristol Brewing: Laughing Lab Scottish Ale, and Winter Warlock Oatmeal Stout. Crazy Mountain: Cara De Luna-Black Ale, Snowcat Coffee Stout. Grimm Brothers Brewing: Fearless Youth – Munich Dunkel, Master Thief – German Porter, Devil’s Riddle – Bourbon Barrel Old Ale. Renegade: Hammer & Sickle- Russian Imperial Stout. Tommy knocker Legend- 20th Anniversary Olde Oaked Brown Ale, Cocoa Porter- winter seasonal brewed with cocoa porter and honey. Verboten: Mountain Man-Imperial Dark Cream Ale, Rum Barrel Aged Pure Imagination, Double Oatmeal Stout aged in a Dancing Pines Rum Barrel, What Hump-Sour Porter. Wasatch and Squatters: Polygamy Porter, The Devastator Dopplebock, Squatters Outer Darkness Stout, Wasatch Winterfest. Wynkoop: Gingerbread Stout- Imperial Sweet Stout, 2013 Whiskey Barrel Aged Barley Wine, Coconut Milk Stout, Brewjolais Noveaux 2013-spontaneously fermented sour beer made with marash chile peppers, cuit la coche, and foch grapes.